These beautiful floral cards will send birthday blessings in a most lovely way. He made the world a more wonderful place. You're celebrated today and thought of often. with joy and your year with many blessings from Him. and from our Lord Jesus Christ. 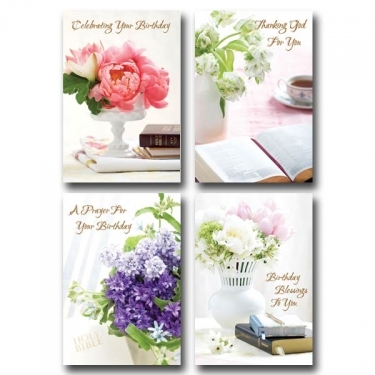 Flowers Birthday Box of 12 is published by Dayspring and is our 1023rd best seller. The ISBN for Flowers Birthday Box of 12 is 081983326721. Be the first to review Flowers Birthday Box of 12! Got a question? No problem! Just click here to ask us about Flowers Birthday Box of 12.